Aquarium Cap Blanc, better known as “the lobster cave”, owes its name to the traditional use it had in the past as a lobster vivarium. The cave was adapted for use as a fish and lobster reserve with five water inlets, still conserved today, which guarantee correct water circulation and oxygen levels. From the reserve, lobsters were exported to the markets of Barcelona and other cities. Also, fishermen kept here the live lobster they had caught but not sold, to sell in times of bad weather when fishing was impossible. 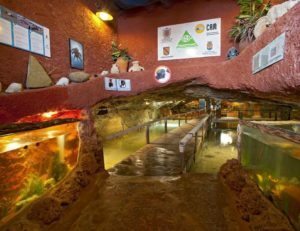 In 1989 the cave was converted into the aquarium. At present, the installations are used by the CREM, the Marine Recuperation Centre, so there are often sea animals recovering here, especially turtles.